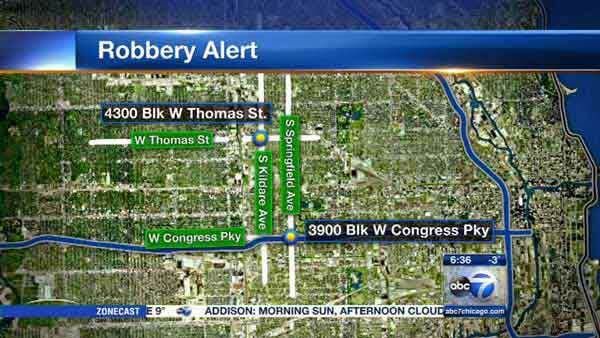 CHICAGO (WLS) -- Police are warning of two boys between the ages of 14 and 18 stealing purses on Chicago's West Side. Authorities said two teens riding bicycles and wearing hooded sweatshirts robbed people in the city's West Humboldt Park and West Garfield Park neighborhoods. The incidents occurred in the 4300-block of West Thomas Street around 8 p.m. on Jan. 1 and in the 3900-block of West Congress around 8:45 p.m. on Jan. 3. In one case, one of the boys flashed a knife before taking off with the victim's purse.